How to build a high performance Ecommerce category tree (for faster and more frequent purchase decisions) - Part 1/4: Four important factors to know before you start. Are you confident your Ecommerce store’s category tree is driving as many sales as it should be? Could it be losing you sales? After years of working with thousands of Ecommerce stores, we’ve found that many store owners have trouble creating effective category trees, despite the fact that a well structured category tree is fundamental to driving sales. We’ve created this 4-post series to give you a clear guide on how to correctly organise product data and online navigation (no matter what size your inventory), to improve the performance of your store. Following this series and putting it into action will help your customers easily find what they are looking for, and make quick, accurate (and more frequent) purchase decisions. Make your products easy to find, compare and choose to increase Ecommerce sales. 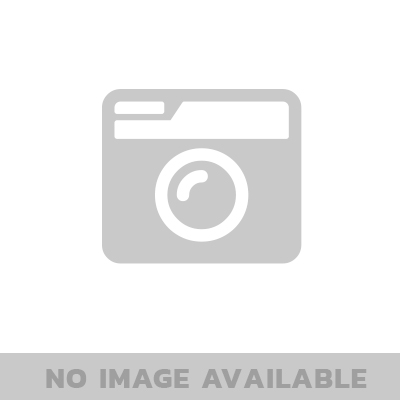 Why does your store need a good category tree? Your category tree and navigation is the tool you present to your customers to help them find and purchase products from your store. If you create a confusing, inaccurate or insufficient category tree, your customers will feel lost or frustrated, and simply bounce to your competitor to find what they want, and buy from them instead. 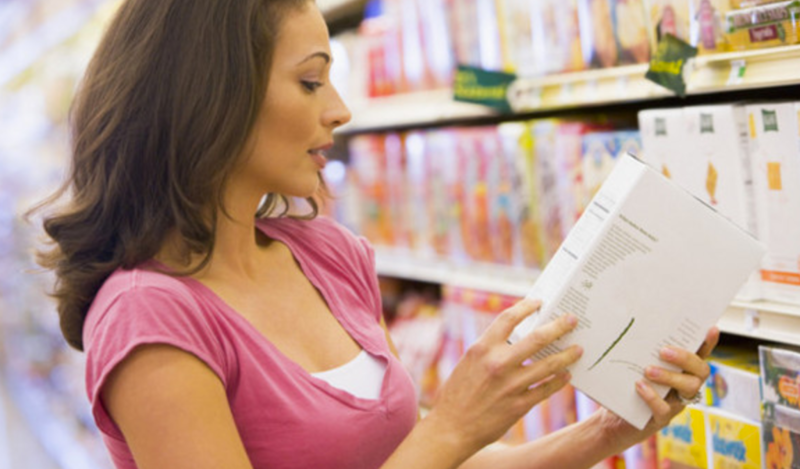 Using our guide, you will be able to create an intuitive product navigation system that guides customers to the product category they are looking for, allow them to browse and compare your range, and make a purchase decision with the least amount of friction. A good category tree is also excellent for SEO (leading to more traffic), but we will cover that in a different post. For now, just be sure that following this procedure will help improve user experience, leading to more add to carts and completed checkouts. There are four important factors to consider before building your tree. Before you begin with the actual data, you need to know what it means for you to be successful. This ensures you take the right steps that will actually get you to those goals. We recommend getting the whiteboard out at this stage, and really getting clear on your end goals. Most likely, this will simply be to make more sales, but you may find that you have particular ranges that you want to sell more of, or you may be going through a product launch or seasonal promotion and want to prioritize those on top of simply making more sales across the store. These should be your money makers, your most popular items and the products with the highest profit margins. Especially if you are a manufacturer or it’s your own brand. It could be the cornerstone product for your purchase - for example if you are selling Jeep accessories, the ‘Lift Kit’ is likely a cornerstone product. 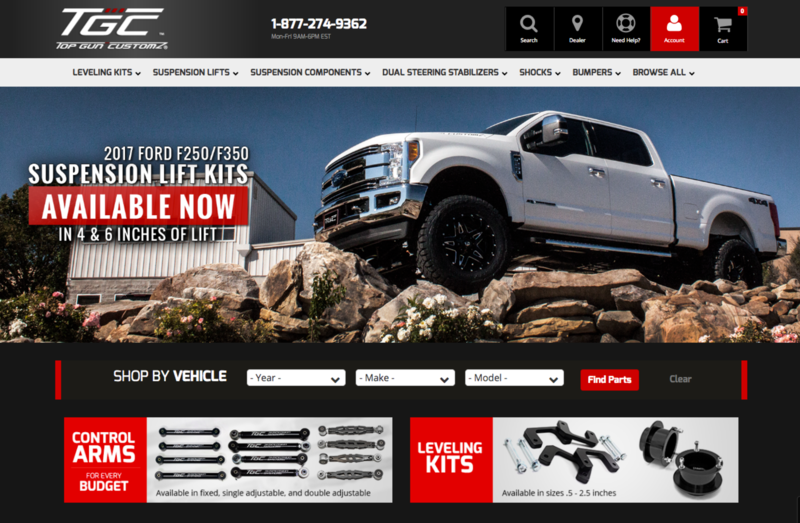 A client site we built recently that prioritizes lift kits, control arms and leveling kits as key products. Your cornerstone products should be available within three clicks. Customers are most commonly looking for them, so presenting them upfront will lead to more conversions, while leading customers deeper to purchase more. Keep a note of these, and prioritize them when you build your tree. You don’t want to force customers to ‘stumble over’ your smaller products and complete category listings to find the products they want. There are a lot of short term memory studies out there showing that we can hold between five and nine items in our minds, but anything over that and we tend to become overwhelmed. To avoid decision fatigue, ideally you want your items to be easily located within ‘three clicks’ from where they begin. This isn’t an option for all items, particularly if you have a larger inventory, but should apply to your key products. Factor 4: Would this make a good landing page? When building your category pages, consider how this page would perform if you were to use it as a landing page for PPC, SEO or email list traffic. Would you send traffic to this page? If you did, how would it perform? If you think it would perform poorly, you need to reconsider the content of the page. Do you have too many types of product here? Do you not have enough? Should you add a little copy at the top to set expectations? Could you add breadcrumbs or related categories for customers to navigate to if this page isn’t right? 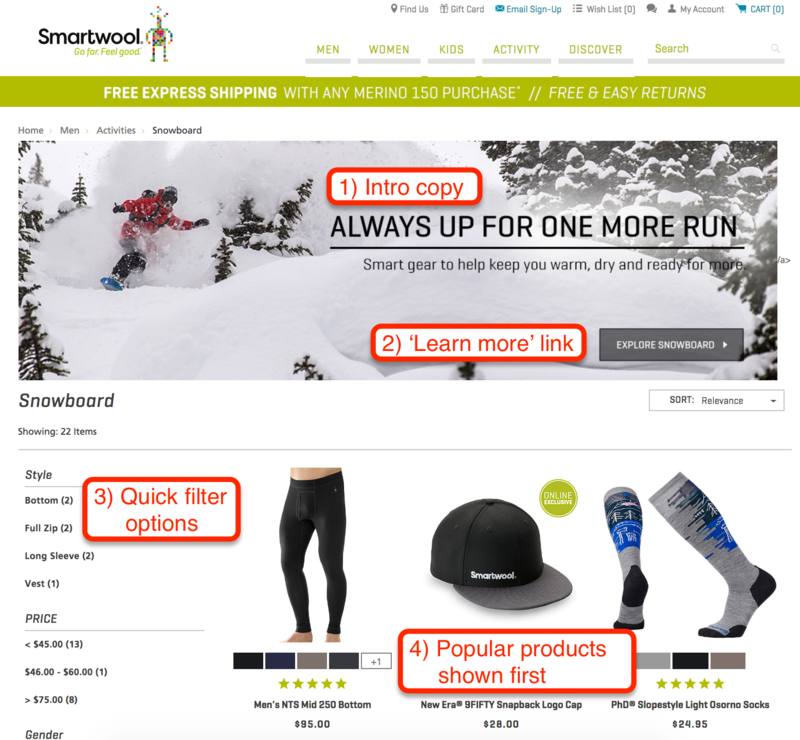 Smartwool are using good copy to catch interest, a link to learn more, quick and easy filtering options and popular products sorted by relevance. New customers are very likely to stick around and check out their products, which is the primary goal of a landing page. Now that you are aware of these four factors, you’re ready to start prepping your data! Check out our next post to find out exactly how to do it. Have questions about this advice? Let us know your burning question about building an Ecommerce category tree in the comments below!